A flowing river is a literary metaphor for existence and time. Flowing water often symbolizes the unity and eternity of the universe. Ocean currents are the ocean's great rivers. Ocean currents are continuous conveyances of water that flow in predictable paths for thousands of miles. 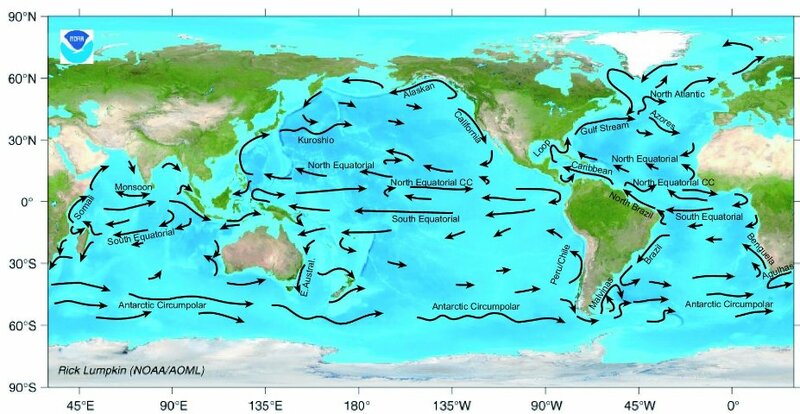 Ocean currents determine the climate in many parts of the world. The swift Gulf Stream transports warm water from the tip of Florida northeast across the Atlantic ocean toward northwest Europe making this part of Europe more temperate than any other region at that latitude. The Gulf Stream carries almost four billion cubic feet of water per second which is a flow rate that exceeds all of the world's rivers combined.